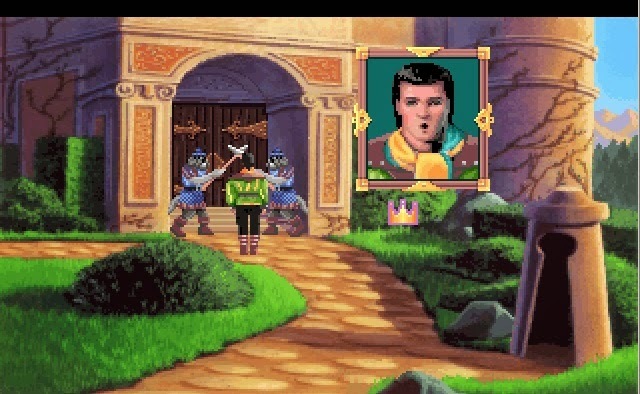 Girl in the Tower is a track that would sound very familiar to those who have played King's Quest V as it borrows heavily from Cassima's Theme - which makes perfect sense since King's Quest VI is all about the love story between Prince Alexander and Princess Cassima. Mark Seibert worked on Cassima's Theme so it's no surprise that he also worked on Girl in the Tower but what was different is that he wanted to give the song the "top 40 love ballad" treatment and make it into a duet. Seibert wrote the song in 1992 although it wouldn't be until the next year that a CD-ROM version of the game would be released and allow players to hear the song sung in all its glory by Bob Bergthold and Debbie Seibert (with Ron Delarm on guitar). "GIRL IN THE TOOOOWER! I'M REACHING OUT! PLEASE TELL ME WHAT TO DO!!!!"